At 15 weeks gestation we went in for a routine check-up. It was here that we found out that the little baby we were expecting was a girl, but that she had only a partially developed brain. The very next day we went to see a specialist and received her diagnosis--Alobar Holoprosencephaly. This is the most severe of all the types of HPE. 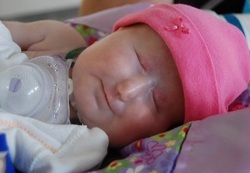 We were not given much hope from the doctors, but we chose, instead, to trust in God who created our sweet Kara Faith. He, and only He, had numbered her days. You can follow Kara's story at her website here, or when you click on the picture above. Our purpose in forming this foundation was to provide tangible support for families and children who are struggling through extremely difficult times. There are always "gaps" in coverage and needs that can't always be met by traditional insurance coverage. We are focused on providing direct support for equipment expenses as well as items designed to provide greater comfort for these children who face tremendous uphill struggles. Our mission is also educational in nature. As part of our mission, we hope to educate families and assist with arranging income streams which will allow them to care for their family into the future. Kara's Hope has also partnered with attorneys and financial experts in order to offer consulting services and referrals to families of special needs children. The ultimate goal of these relationships is to prepare and provide for ongoing needs which will arise throughout the lives of the children. In other words, our mission is not to simply "give someone a fish and feed them for a night," rather, our ultimate goal is to "teach them to fish" and provide the tools and relationships needed to accomplish long term security for themselves and their children. These professionals also support the mission of Kara's Hope. "My frame was not hidden from you when I was made in the secret place. and enter any support amount you wish.